What do people need to survive? How would you feel if you lost any of those things? ​How would you feel if you know your brother or sister or mom or dad or grandma or grandpa went through Cyclone Idai? What would you do? Do you think Jesus cares? How does Jesus feel about people in need? Matthew 25: 40. EXCERPTS: "Cyclone Idai barreled through Mozambique, Malawi, and Zimbabwe over the weekend of March 15-17, 2019, leaving thousands of people displaced..." and over 600 people dead. "ADRA has been on the ground since the cyclone moved out of Zimbabwe, helping up to 650 households with food and hygiene kits, with plans to provide further assistance in hardest-hit areas. ADRA was also helping people in Mozambique and Malawi recover from heavy floods that affected thousands before the cyclone's landfall. On March 18, ADRA deployed 1,000 shelter kits and 2,000 tarpaulins in the port city of Beira, Mozambique, with the assistance of a UN flight convoy, Oliveira added. 'We are also in the process of deploying to Malawi emergency kits from our depots in Nairobi.'" The Apostle Paul calls the Bible our sword. Stand up when you find the Bible reference and start reading. Bible Story: He is Risen! EXPERIENCE THE STORY: Roll-a-Rock - Jesus laid in the tomb. A tomb is like a cave. A huge stone was rolled in front of the opening. Can you roll this "rock" in front of the cave? What day did Jesus die? What day did he "rest" in the tomb? What day did he rise from the dead? How does the tomb stone roll away from the tomb? What happens to the soldiers? Who visits the empty tomb first? 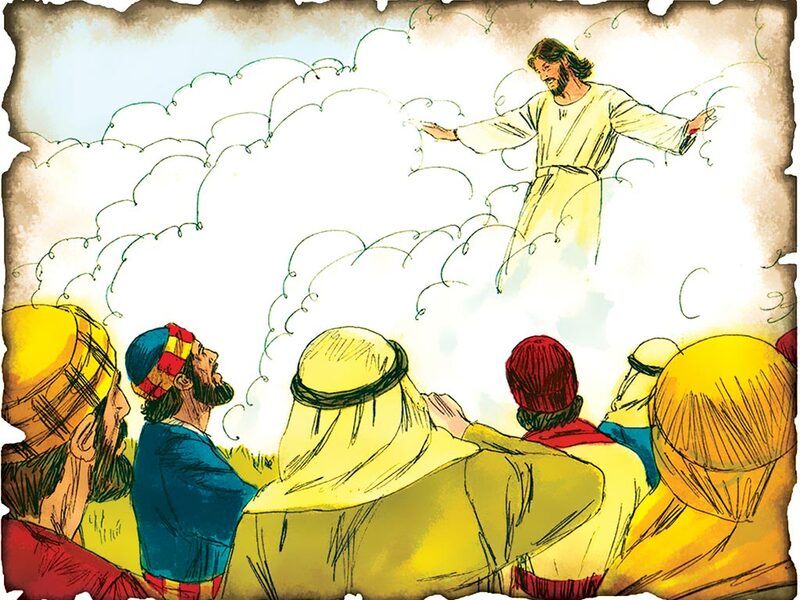 What message do the angels have for the disciples? Who sees the risen Jesus first? 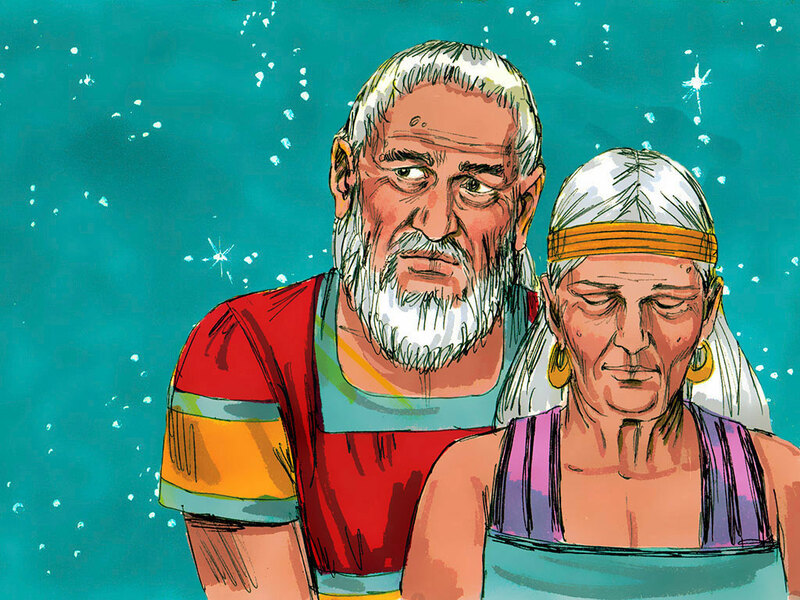 Bible Story: Free at last! ​After Joseph died, many years went by. The children of Israel became a lot of people. A new pharaoh became the king over Egypt. He didn’t like all the Israelites living there. He decided to make them his slaves. He made the Israelites work really hard. He was mean to them. He even tried to kill their children. The Israelites prayed to God for help. Many more years went by. One Israelite named Moses had run away from Egypt. In the land of Midian he watched over his sheep. God called him from a burning bush and told him to go back to Egypt to free his people. God said He would do great signs to show Egypt that only He is God. Moses returned to Egypt with his brother Aaron. 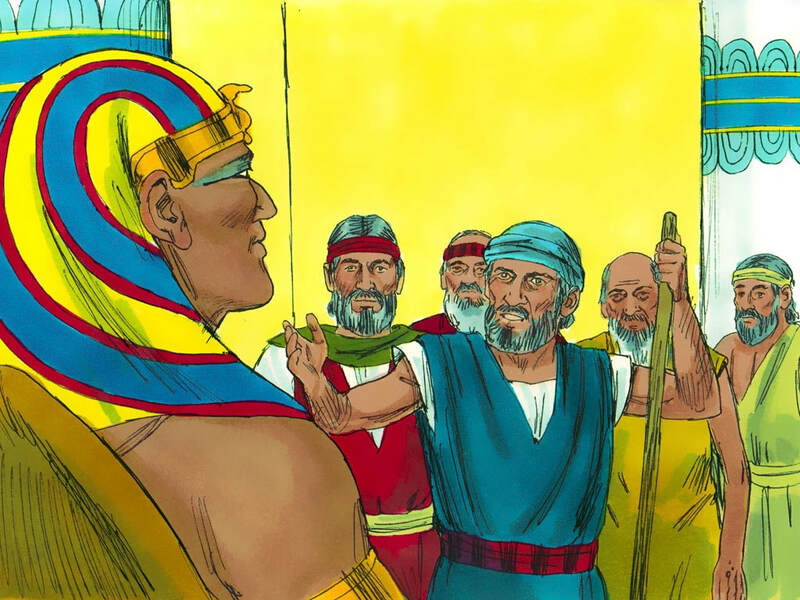 Together they asked pharaoh to let the Israelites leave Egypt. Each time Pharaoh said no, God did an amazing sign. God turned the river to blood. God sent frogs, lice, flies, sickness of livestock, boils, hail, locusts, and darkness to cover the land. Pharaoh still said no! 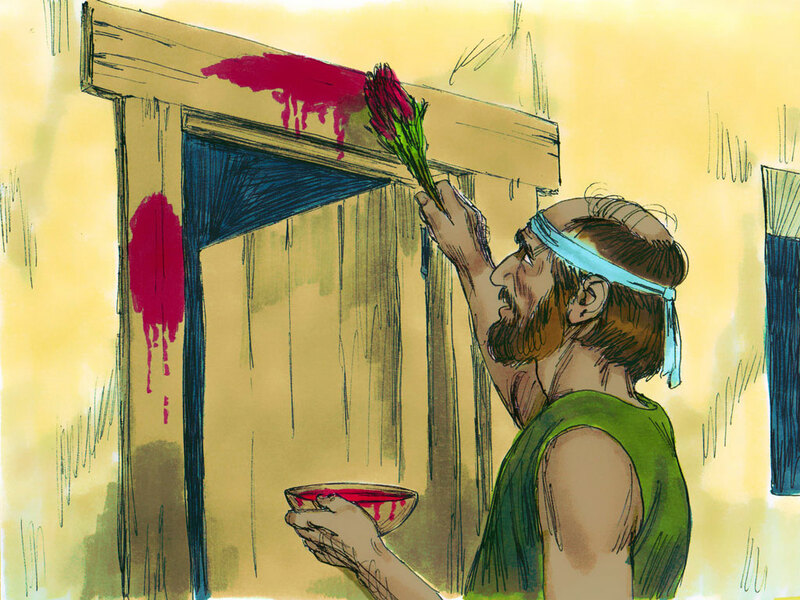 Then God told the Israelites to paint the doorposts of their house with the blood of a lamb. This lamb that died would remind them of Jesus whom God would send to free us from sin. The Israelites obeyed. That night an angel passed over the land of Egypt. When all the first born children of Egypt died, pharaoh let the Israelites go free. Our Bible story reminds me of the prayer verse, John 8:34,36, which says, “Everyone who lives in sin is a slave to sin....So if the Son [Jesus] makes you free, then you will be truly free. " (ICB). God saved the Israelites from slavery in Egypt. He saves us from the slavery of sin. Sin is thinking, saying, or doing naughty things. Jesus, our Passover lamb, died so we could be free from sin. ​ Have you ever wondered why a ball always eventually falls down after you throw it? Why when you jump up, do you always come back down? That invisible force that keeps pulling stuff to earth is called gravity. It keeps everything on earth from floating away into space, including the air we breathe! ​In order for man to overcome gravity and leave the earth, we have to use rockets. Rockets have to have enough force behind them to overcome the force of gravity. They are propelled into the air with a massive explosion that sends them traveling 40,000 km per hour! That’s over 100 times faster than planes travel in the air. Even though sin is the naughty things we do, say, and think, it also works against us like gravity, to make it harder and harder for us to do right. It just keeps pulling us down. Eventually, sin can become so strong it is like slavery and we can’t pull away from it. 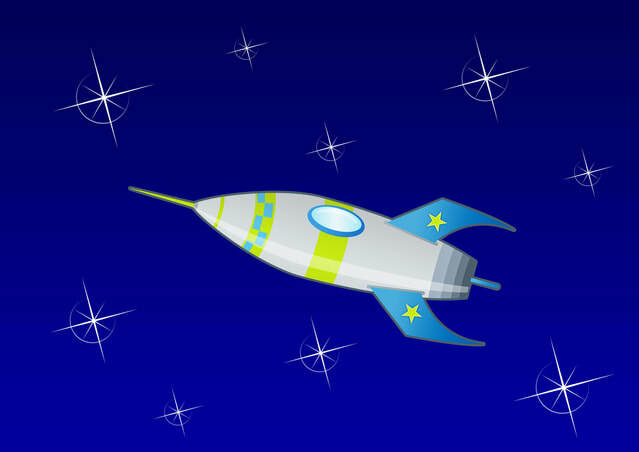 Jesus is our rocket ship to escape the gravity of sin. He gives us power to break free and obey. The next time you find yourself struggling to do what you know is right, ask God for Jesus’ help. Help your child learn important facts about the second coming of Jesus with this song. We will see Him. We will hear Him. Yes, the whole world will know. We will see Him. We will hear Him, when Jesus comes back for me and you!...when Jesus comes back for me and you! This quarter the world church is sending Bibles to Africa. Bring your coins all quarter long to go towards the world mission project. Joseph was one of Jacob’s 12 sons. His brothers were so jealous they had sold him as a slave in Egypt. But God protected him and promoted him all the way up to be Pharaoh’s governor! Joseph ruled the whole land of Egypt under Pharaoh. God showed Pharaoh and Joseph that a great famine was coming. Famine is when no food grows. 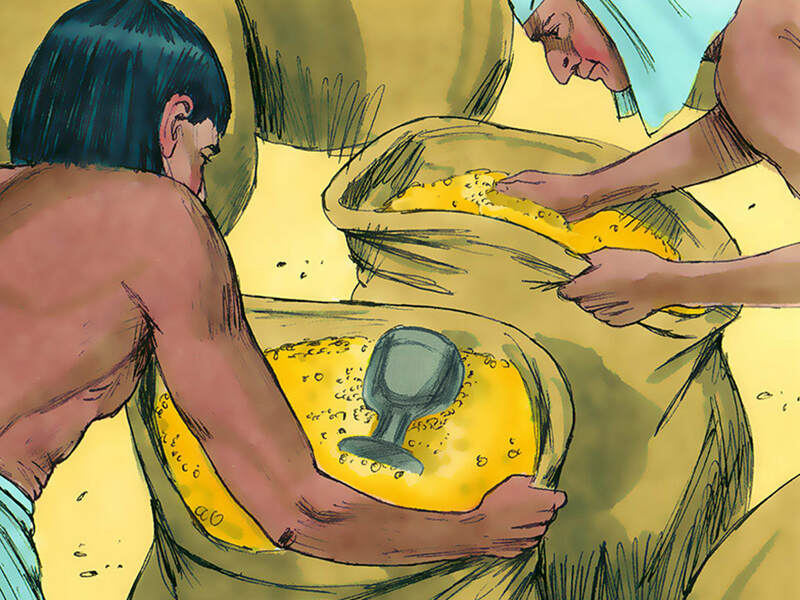 Joseph stored grain during the good years to prepare Egypt for the famine. ​Finally, the famine came. All the food ran out in Egypt and the surrounding nations. The people were hungry. Everyone came to Joseph to buy food, including Israel. 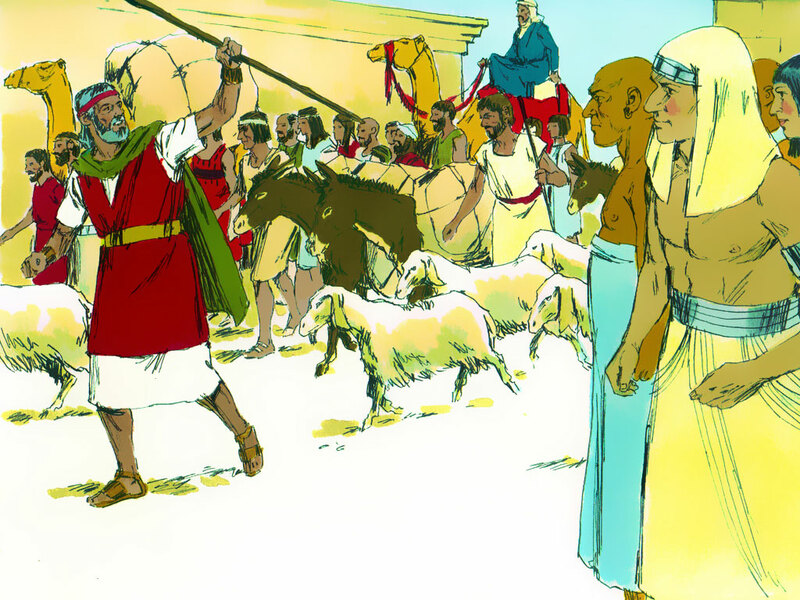 Jacob sent 10 of his sons to Egypt to buy grain. Joseph pretended to be a stranger to his brothers. He tested them to see if they were truly sorry for what they had done. He made them bring their youngest brother Benjamin back with them if they wanted to buy more food. When Benjamin came, Joseph hid his cup in Benjamin’s ​food sack. He accused Benjamin of stealing from him and said Benjamin must be his slave. His brothers were so heartbroken for Benjamin that his brother Judah offered to take Benjamin’s place. Now, Joseph knew they were sorry. He told them he was their brother Joseph. He hugged them and said he would take care of all of them. 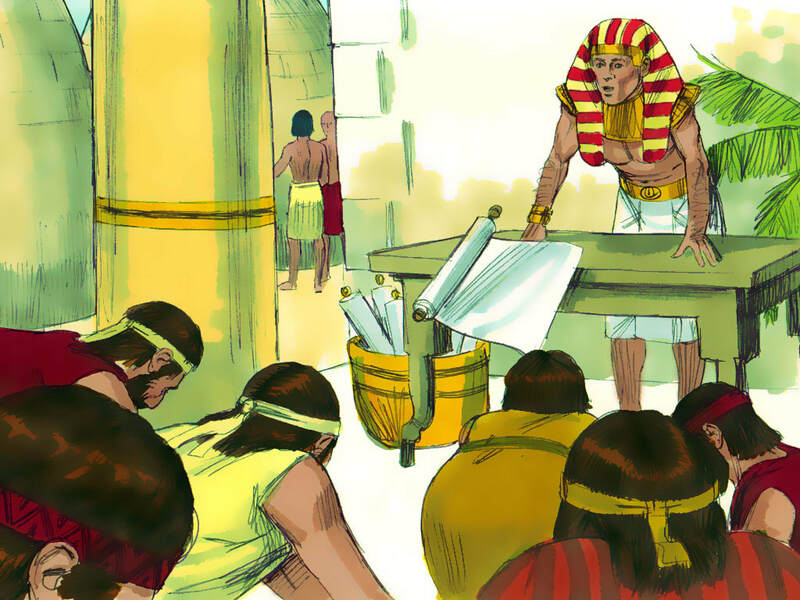 Jacob and his sons’ families all moved to Egypt. Our Bible story reminds me of the prayer verse, 1 Thessalonians 5:15, which says, “Be sure that no one pays back wrong for wrong. But always try to do what is good for each other and for all people" (ICB). 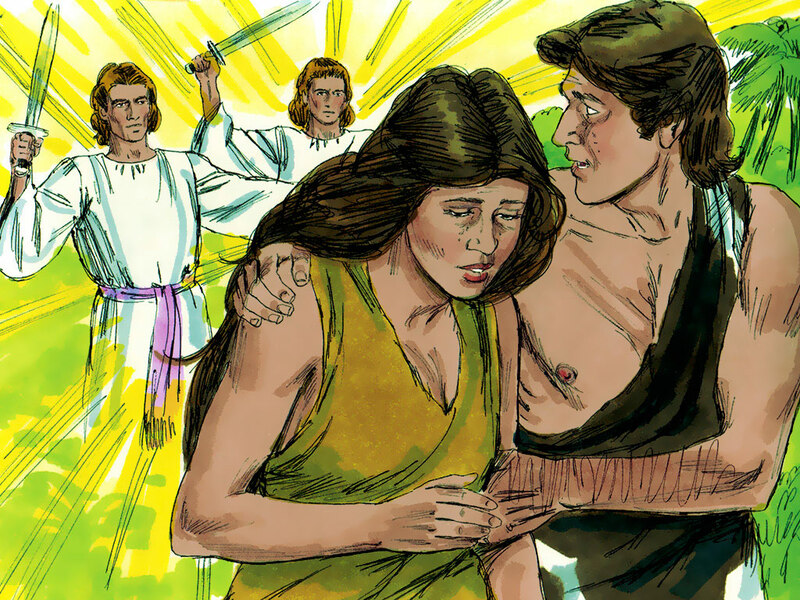 Even though Joseph’s brothers had been very mean to him when he was younger, Joseph did not pay back their wrong. Instead, he gave them food and took care of their families. Do you have a brother or sister? Sometimes you need to say, I’m sorry. Sometimes you need to forgive. God can help you be friends again. 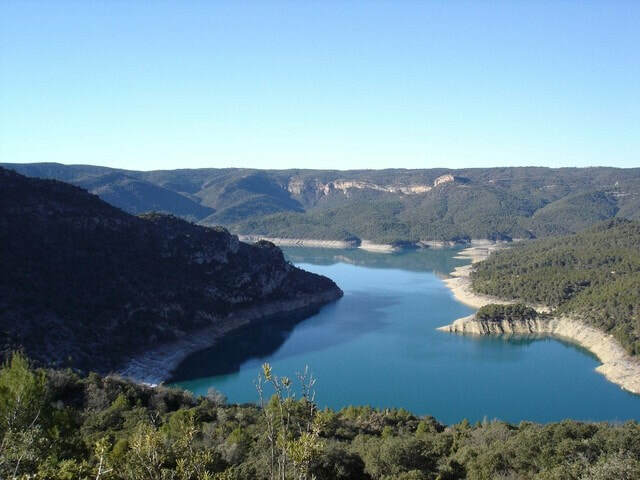 ​Do you like to check on the weather and know when it will be sunny or rainy or cold or hot? Sometimes, the weather becomes so intense, it destroys or hurts the earth and its creatures. When destruction happens from natural causes, we call that natural disasters. 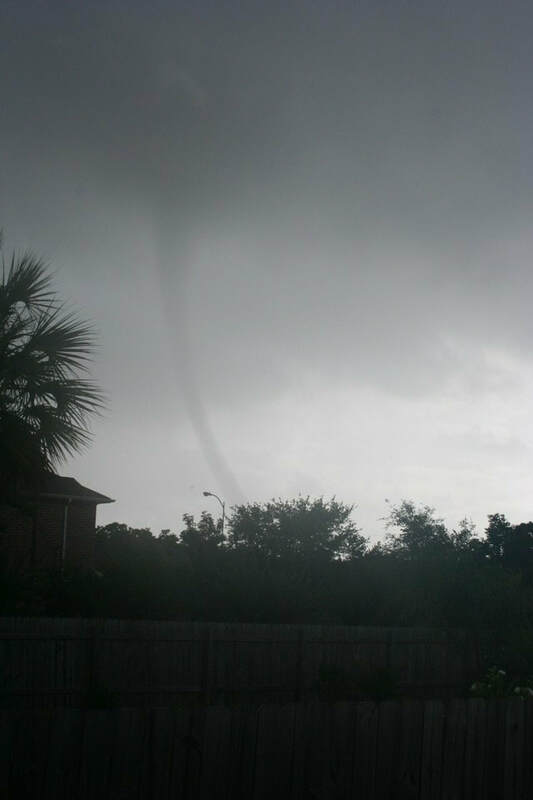 ​Tornadoes and hurricanes happen when the air swirls around so fast that it picks up anything in its path. Tornados happen over land. Hurricanes start over the ocean. Their winds can destroy even strong buildings! ​Earthquakes are not caused by natural forces in the air, like tornadoes or hurricanes. Earthquakes happen when there is movement very deep underground. The movement can be so strong that it causes the ground to shake and buildings to fall down. ​In our Bible story, there was likely a drought that caused the great famine in the land. Drought is when there is no rain for a long time, and all the plants die. When plants die, then animals and people don’t have food to eat. God gave Joseph a plan to get through the natural disaster. Do you have a safety plan at home to deal with natural disasters? This quarter the world church is helping our brothers and sisters in the Southern Africa-Indian Ocean division provide Portuguese Bibles for children in Mozambique, Sao Tome, and Principe. Please send your coins all quarter long to go to the world church mission project. 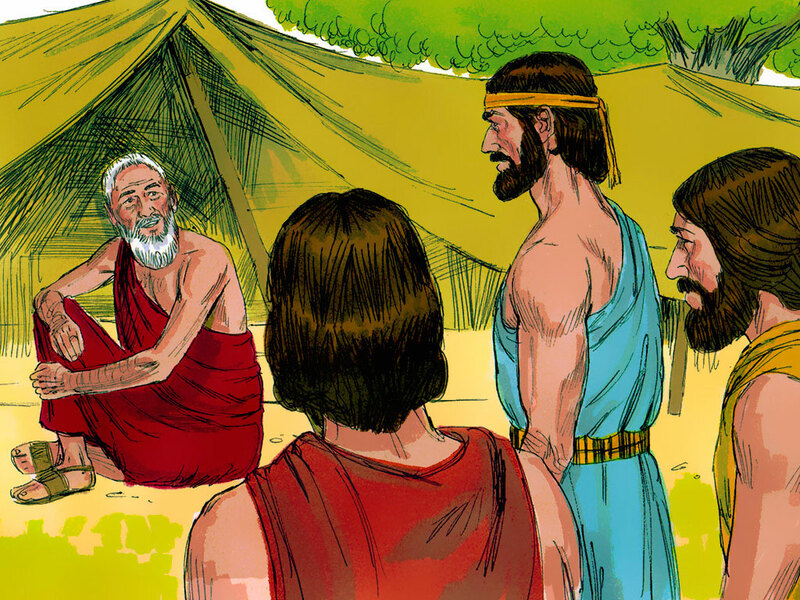 ​Abraham’s son Isaac had a family of his own. His wife Rebekah had twin sons named Jacob and Esau. When the boys grew up, it was time for Isaac to bless his sons. 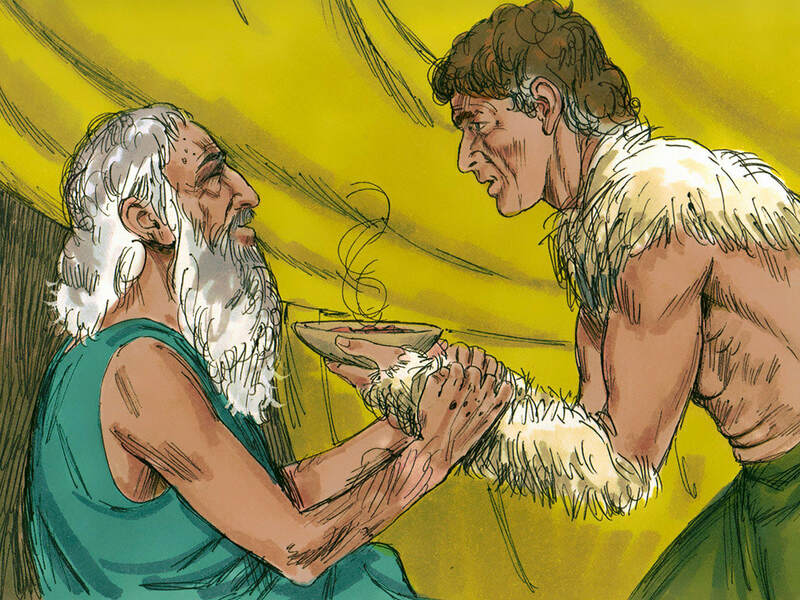 Jacob pretended to be Esau and tricked Isaac into giving him Esau’s blessing. 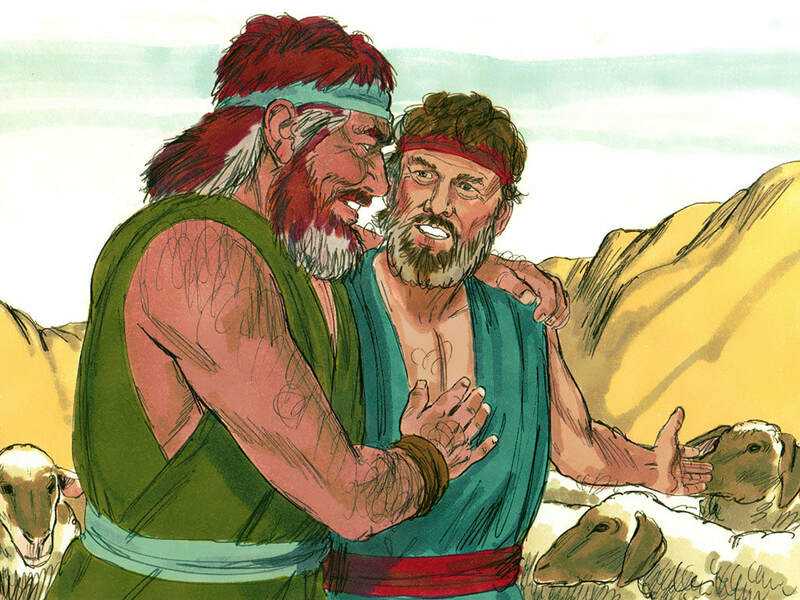 Esau was so angry at Jacob that Jacob had to leave home and go live with Rebekah’s brother Laban in Haran. He started a new life, got married, and had children. After many years, Jacob decided to return to Canaan. He packed up his family and all his animals and set off. A servant went ahead to bring a friendly message to Esau who lived in Edom. But Esau didn’t want to talk. He was coming with 400 men! Oh no! Jacob was scared. 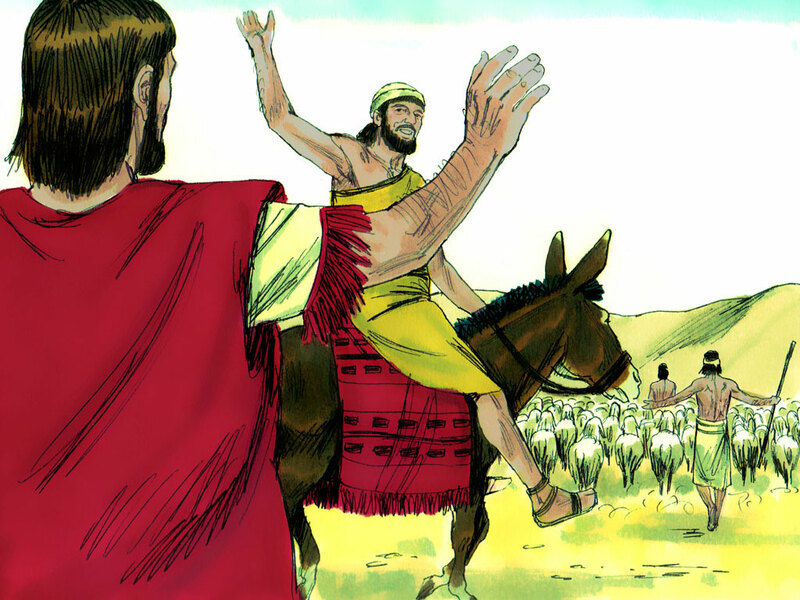 He thought Esau was coming to kill him. That night, when everyone else was sleeping, Jacob crossed the RIver Jabbok to pray. Suddenly, a man grabbed him. The two men wrested all night long. As the sun came up, the man said to Jacob, “Let me go!” But Jacob replied, “I won’t let go until you bless me.” The man said, “Your new name will be Israel because you have fought like a prince with God and with men and have won.” The man touched Jacob’s hip, so Jacob walked with a limp. Jacob knew he had wrestled with God. 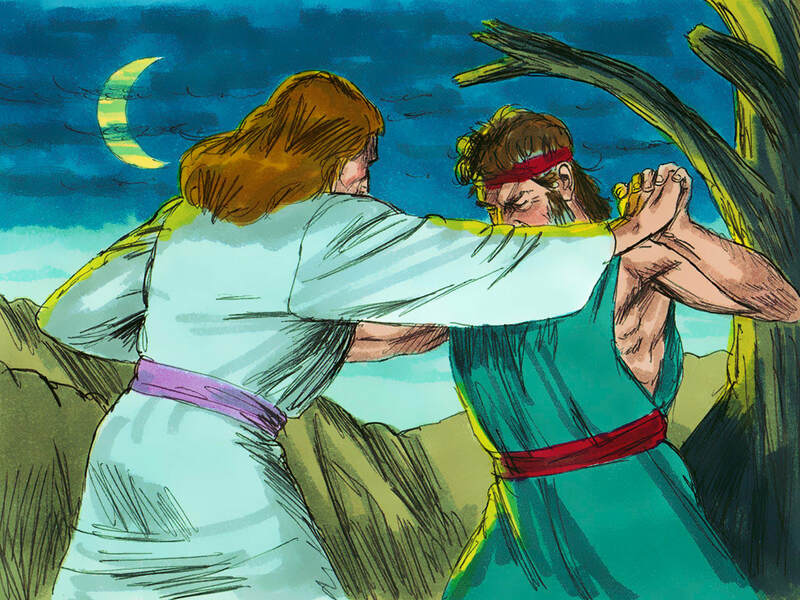 When Esau met Jacob the next day, He did not try to hurt him. He hugged him. Our Bible story reminds me of the prayer verse, Hebrews 4:16, which says, “Let us...feel free to come before God’s throne....[We] can receive mercy and grace to help us when we need it." (ICB). Jacob went to God when he needed help, and God came to him and gave him the forgiveness and blessing he needed to face his mistakes. We all make mistakes, like Jacob. Don’t be afraid to ask God for forgiveness and help to make things right. His throne is always open to us. ​God has given all living things special abilities to survive in their environments called adaptations. Jacob pretending to be Esau, so he could trick his father, reminds me of an adaptation called camouflage. 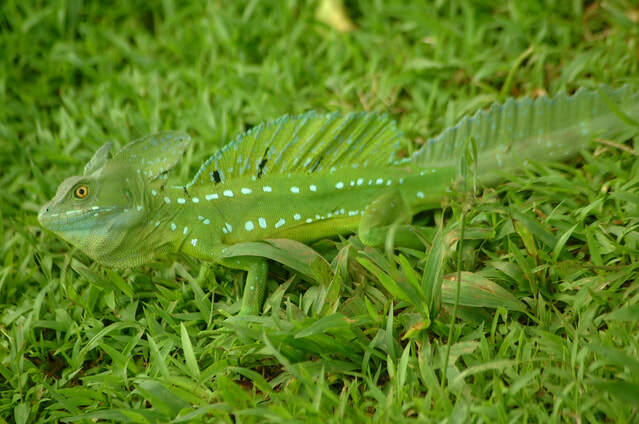 Camouflage is when animals change their color or just look like something in their surroundings. It makes it harder for another animal to see them. Below are some examples of camouflage. ​Many toads, frogs, and lizards can either change their skin color or are colored naturally to blend into their surroundings. A toad that lives in the woods might look more brown, so it blends into the fallen leaves on the ground. A frog that lives in the trees might look more grey to blend into the tree bark. A lizard that lives in the desert might look like sand. ​There are some bugs that are interesting, too! A stick bug literally looks like a walking twig! Moths and butterflies sometimes have big circle patterns in their wings to look like the eyes of a big animal. ​Even though Jacob tried to be someone he wasn’t, God saw him clearly and knew of his sin. We can’t hide our mistakes from God. Just tell Him what you did, and He will give you help to make things right. Jesus is coming back soon! Image courtesy of Sweet Publishing and FreeBibleImages.org. ​Many years went by. Abram and Sarai were very old. They still had no children. When Abram was 100 years old, God appeared to him and said, “I am changing your name to Abraham because I have made you a father of many nations. I am changing Sarai’s name to Sarah because I have made her a mother of nations. Your children will inherit the land of Canaan.” It seemed impossible to have children when you are old, but Abraham believed God’s word. Just as God promised, the next year, Sarah gave birth to a son named Isaac. She laughed again, but this time, with joy! Our Bible story reminds me of the prayer verse, Luke 18:27, in which Jesus says, “There are some things that people cannot do, but God can do anything." (CEV). Abraham trusted in God to fulfill His promise even when it seemed like having a baby was impossible. Trusting in God to do what He promises in His Word is called faith. One special promise God gave in the Bible was the promise to send His Son Jesus to die for our sins. He did just that. Our part is to believe Him, like Abraham. 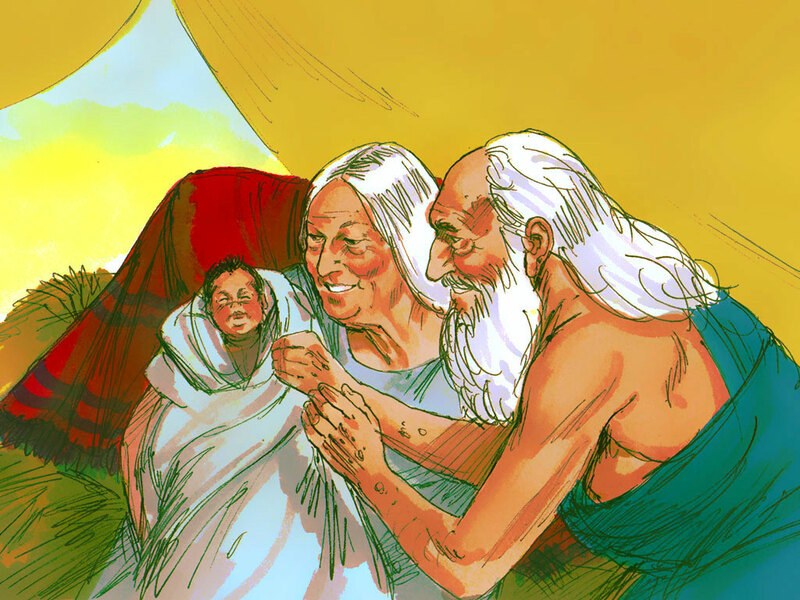 ​God giving Abraham and Sarah a son in their old age was an amazing miracle. In nature, we see the creatures God made do so many amazing things. Let’s look what a couple of God’s creatures can do, then have faith in God’s ability to do anything! 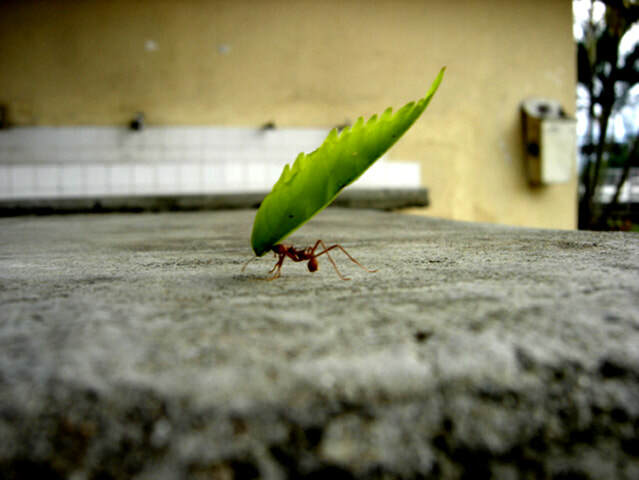 ​I hope you don’t squish every ant you see. They truly are amazing creatures to watch. One special ability God gave them is being able to carry things that weigh 5,000 times their weight! That’s like you being able to carry an elephant! Impossible! But not with God! 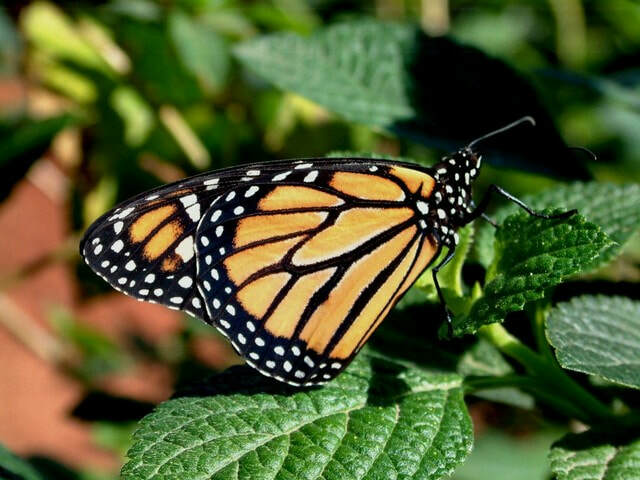 ​The Monarch butterfly is another amazing creature God made. In the 4th generation, it travels up to 2,000 miles from northern United States and Canada down to Mexico to hibernate for the winter. The Monarch “great grandchild” knows exactly how to find the special mountains its great grandparents hibernated in without their help! That’s impossible for you and me, but not with God! ​God certainly loves the creatures He made, but He loves us so much more. If He can help the lowly ant carry its burdens and help the Monarch butterfly find its way home, certainly He can do anything for you and me. Believe in His promises. Saturday is the holy Sabbath. It’s God’s special day. When Sabbath starts, we pray. When Sabbath ends, we pray. Sabbath is God’s special day to spend with Him. This quarter the world church is helping our brothers and sisters in the Southern Asia-Pacific Division share Jesus with the people there. One special project that will share the 13th Sabbath mission offerings is building new Sabbath school rooms for a church in Malaysia. Please bring your coins each Sabbath to donate to the world mission project. Abram and his nephew lot continued traveling together with their families, servants, and animals. 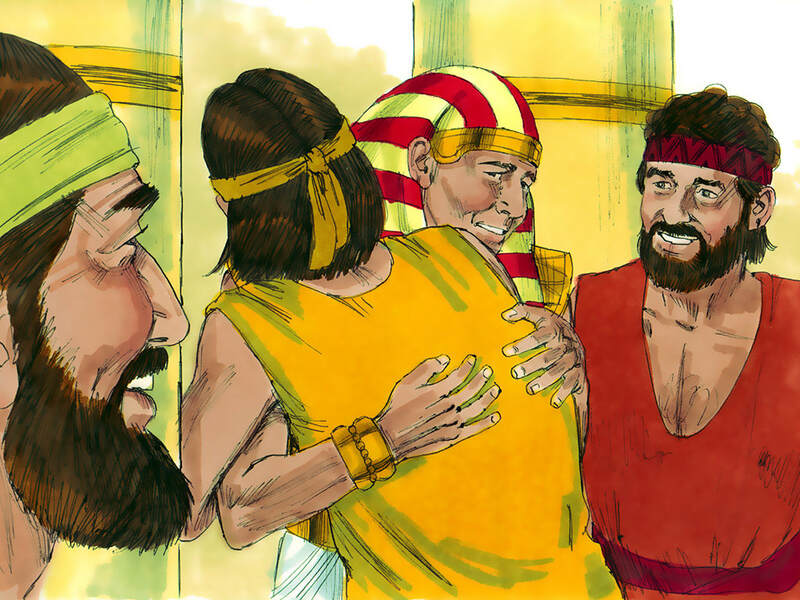 After a short trip to Egypt, Abram and Lot came back to Canaan to the place where Abram had set up his first altar to God. There they worshipped the Lord. ​Soon there was quarreling. Abram’s servants were mad at Lot’s servants. Lot’s servants were mad at Abram’s servants. There just wasn’t enough pasture for everyone’s animals to be in the same place. ​Abram loved his nephew. He didn’t want any arguing, so he said to Lot, “The land right here is not enough for all our animals. Why don’t we separate? You pick which way you’d like to go. Then I will go the other way.” Lot had grown into a big group. He looked out at the land. To the east, everything seemed greener, perfect for hungry sheep. “I will go east,” he said. ​ Abram was happy to give Lot the first choice. “That sounds good,” he said, “I will go the other way.” So the two of them hugged and separated. Lot journeyed east toward the cities of Sodom and Gomorrah. Abram journeyed towards Hebron. ​Our Bible story reminds me of the prayer verse, Genesis 13:8, in which Abram says to Lot, “There should be no arguing between you and me....We are brothers." (ICB). Abram wanted to keep peace between him and Lot. He was willing to let Lot choose first, so Lot could be happy. God wants to help us get along with others, too. Do you have a brother or sister? Why not let them choose first? Be happy for others when they have something you like. 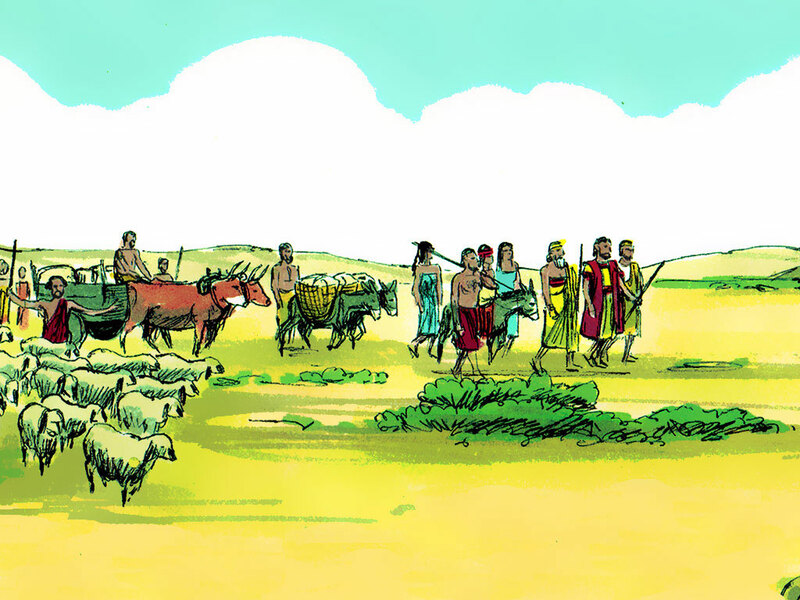 ​Our story about Abram and Lot’s animals and servants not having enough space to live peacefully reminds me of the importance of natural resources. Natural resources are things that we all need and use that are found in nature, like air, water, plants, animals, and oil under the ground. Sometimes people use up too many natural resources that the resources start to disappear. 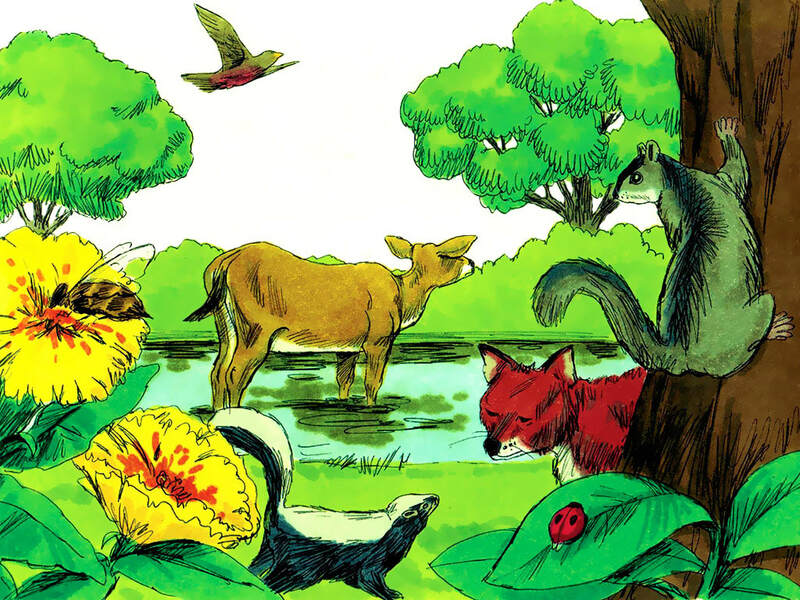 For example, Abram and Lot’s animals needed to eat grass. But maybe there was not enough in the area for so many animals. 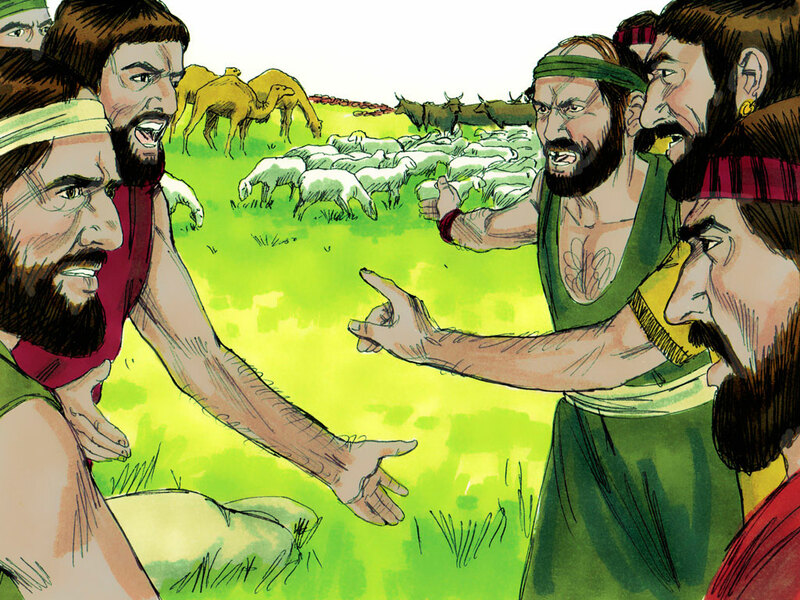 Abram made a wise choice that protected the pasture by spreading the animals out over more land. This allows the grass time to grow back and still be there. ​Other ways to protect our natural resources include not polluting our air and water, not killing plants or bugs with harmful chemicals, and finding ways to reduce how many car trips we take. ​We make choices all the time about how we will use natural resources. God has designed things so that when we make good choices with using and protecting natural resources, we actually help ourselves live healthier and happier lives. This quarter we are memorizing facts about the Sabbath in song. If your child can fill in the blanks, they will earn a new item to add to their Bible artifact collection. There was a descendent of Noah named Abram who was a true worshipper of God. He lived in the land of Ur with his wife Sarai, his servants, and his animals. He didn’t have any children. 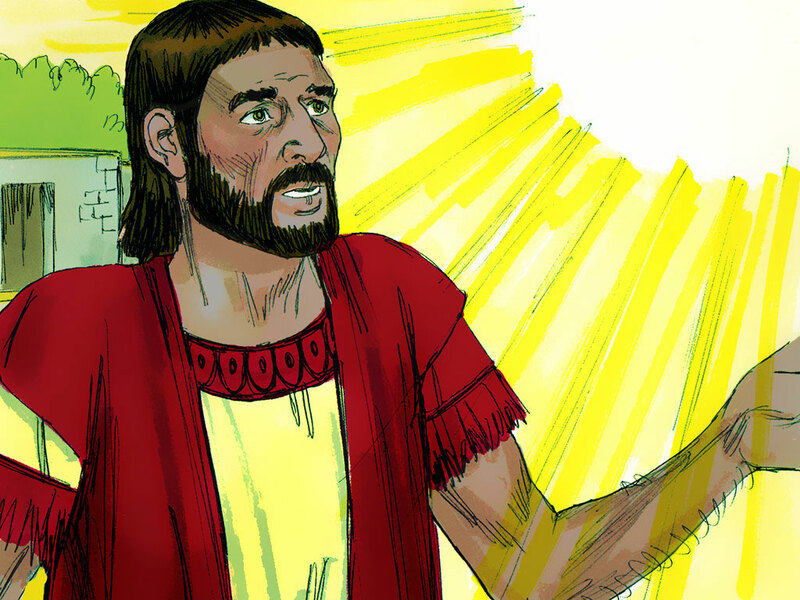 ​One day, God called out to Abram. “Abram, leave your relatives and homeland. Follow Me to a new land, and I will bless you. I will even bless the whole world through you.” God was testing Abram’s faith. Would Abram believe and obey God’s word? ​Abram and his family set off from Ur to Haran. 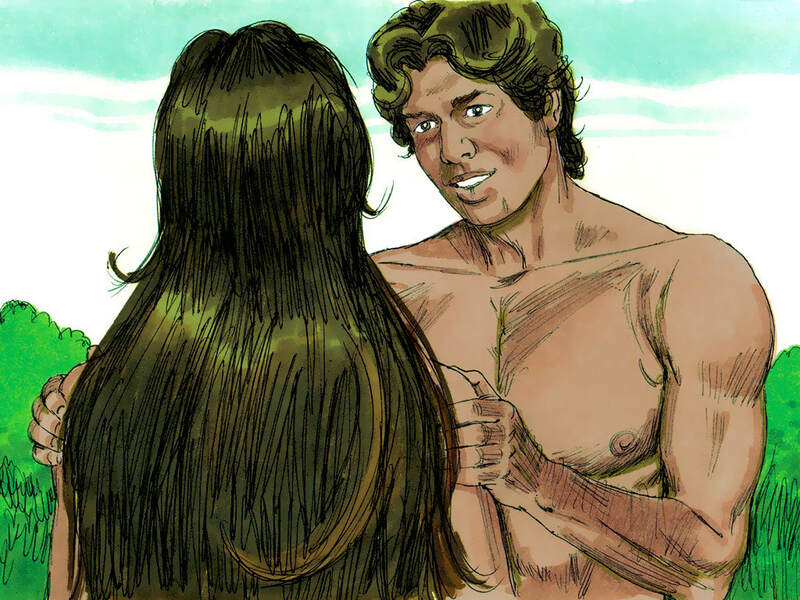 While he lived in Haran, Abram’s father Terah died. Then, God called Him again. “Abram, leave your relatives and homeland. Follow Me to a new land.” Abram obeyed. Many of his relatives stayed in Haran, but Abram’s wife Sarai, his nephew Lot, and his servants went with him. God led him to the land of Canaan. 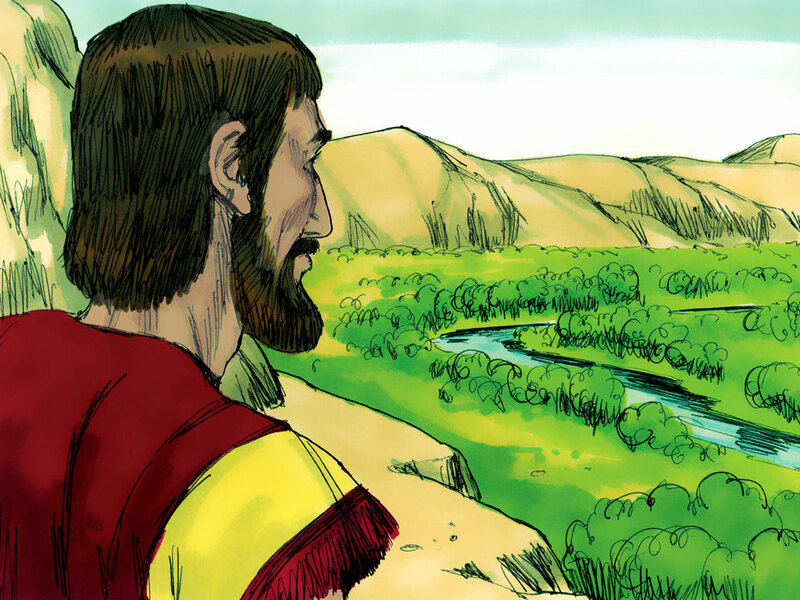 ​Canaan was a beautiful land, but there were lots of people already there. Abram was sad to discover that the people there worshipped idols and did evil things. ​At Shechem, Abram built an altar to God and worshipped Him. He taught all his household to worship God. 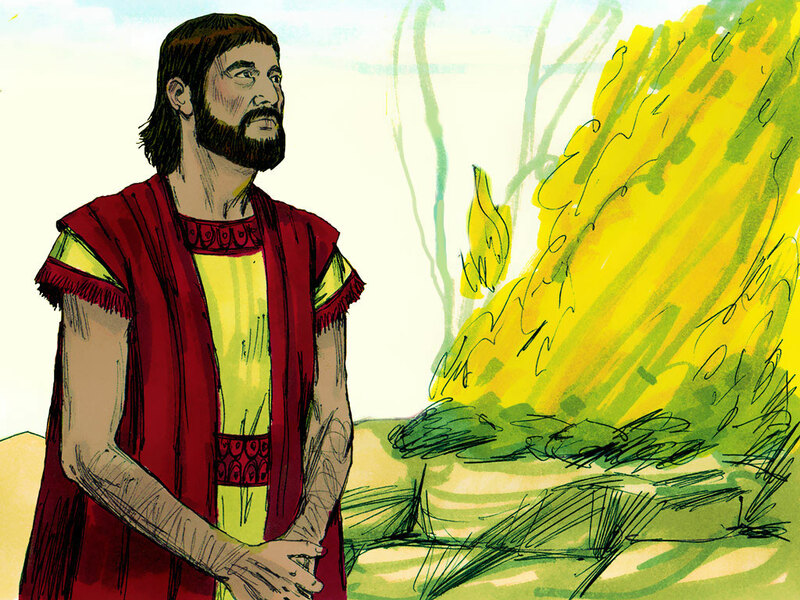 Everywhere Abram moved in Canaan, he set up an altar to the true God. ​Our Bible story reminds me of the prayer verse, John 10:27, in which Jesus says, “My sheep hear My voice, and I know them, and they follow Me" (NKJV). Abram obeyed God’s voice because he knew it was God and he knew God was good to him. As we spend time with Jesus in His Word, the Holy Spirit will speak to our hearts and give us strength to obey. Then we will discover how good Jesus is because we have tested His word for ourselves. Will you be like Abram and trust and obey God’s word? ​Abram moving to a new land at God’s direction reminds me of a miraculous phenomena in nature called migration. 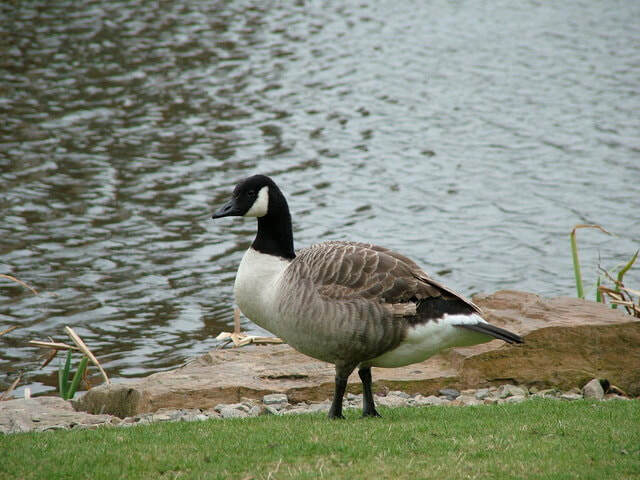 Migration is when certain animals or critters move to a different place. Many travel in groups like Abram did with his household. ​Animals migrate because their food source is gone, they need to mate and have babies, or they just need to rest more comfortably for the winter. Animals can travel hundreds or thousands of miles to get to their same perfect spot from generation to generation. ​Here are a couple of examples. When salmon fish are ready to mate, they leave the ocean and travel up dangerous creeks and waterfalls to get back to the place where they were born. 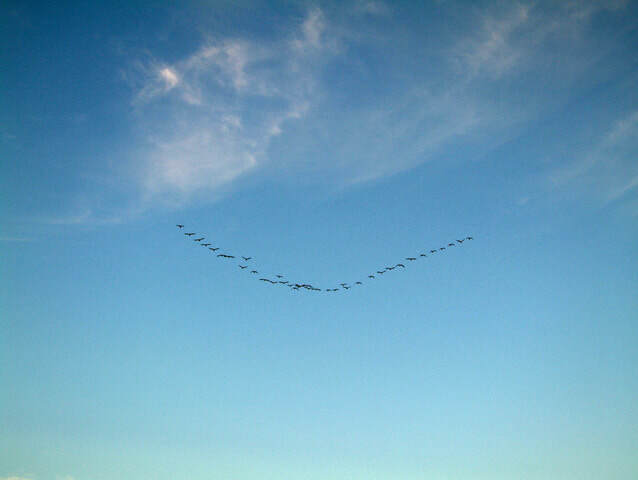 Each fall, you can hear and see geese fly overhead in a V-shape, as they seek water sources that are not frozen. ​How do animals know where to go? God guides them. He wants to guide our lives, too, just as He does for the migrating animals and just as He did for Abram. Take some time to look up more examples of migration and wonder at God’s leading. Noah got right to work following the plans God gave him. When people asked Noah what he was doing, Noah told them that God was sending a flood. People laughed at Noah. 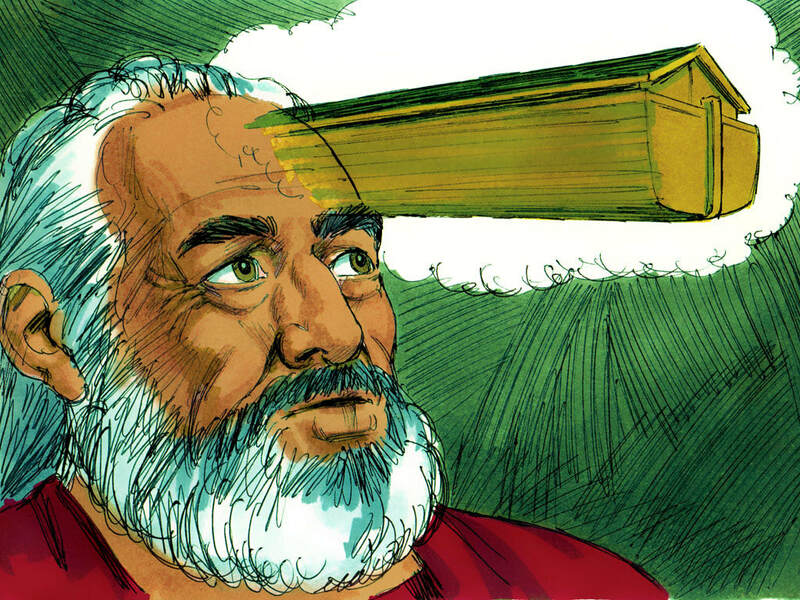 Noah worked on the ark and preached to the people for many years. 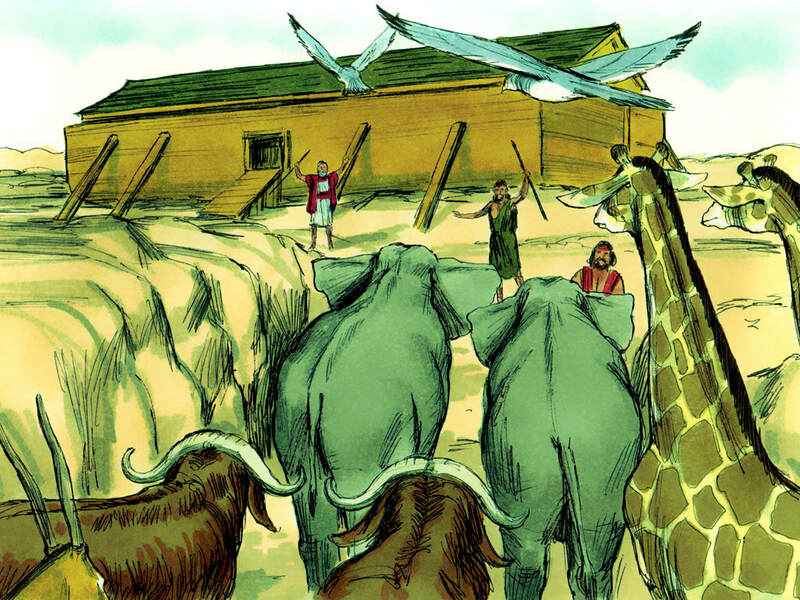 When the ark was finished, Noah brought food into the ark for his family and for all the animals that would come. Noah called to the people to come in, too, but only Noah’s sons, their wives, and Noah’s wife went into the ark. Then something amazing happened! Animals of all kinds came to the ark and went in the door - some by 2’s, others by 14’s. An angel shut the door behind them. ​ Then the rain came. 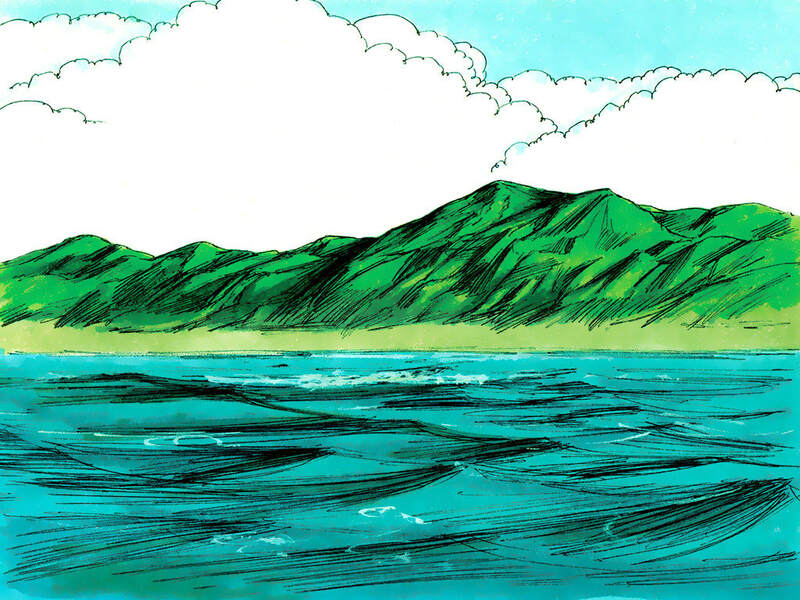 Water filled the whole earth and covered every mountain peak. Noah, his family, and the animals in the ark were safe. They waited many days for the water to go down. Finally, God said they could all come out of the ark. When Noah and his family worshipped God, a rainbow appeared in the sky. God promised to never flood the whole earth again. ​Our Bible story reminds me of the prayer verse, Jude 20, which says, “Dear friends, use your most holy faith to build yourselves up strong." (ICB). Faith is believing God’s word is true and obeying it. Noah had faith. 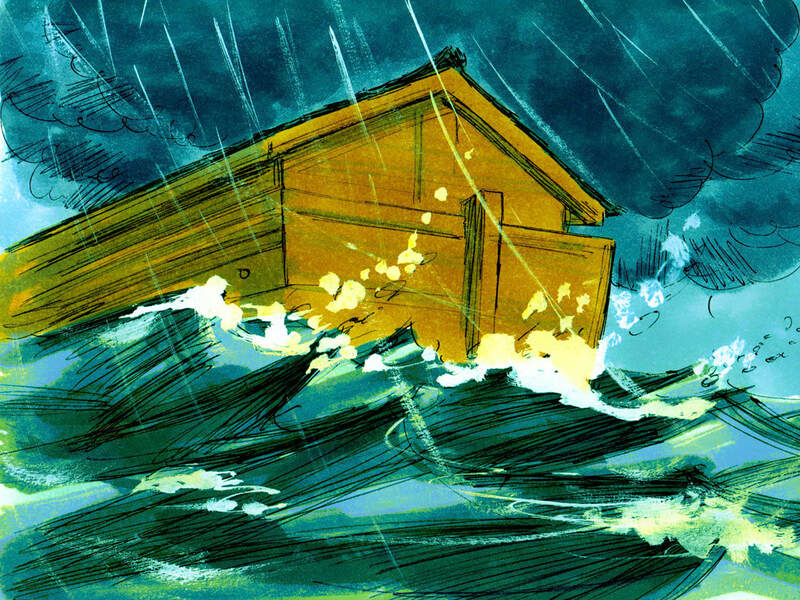 He believed God would bring a flood upon the earth, and he obeyed God’s command to build an ark. Because he lived by faith, his family was safe. God’s word says Jesus is coming soon. Will you build your faith each day by spending time with Him in prayer and reading the Bible? Will you tell others of His soon coming, so they can prepare, too? ​Ever since the great flood, God has used rain to water the earth. One special thing that happens sometimes on a rainy day is a rainbow can appear in the sky. Let’s discover how a rainbow is formed. 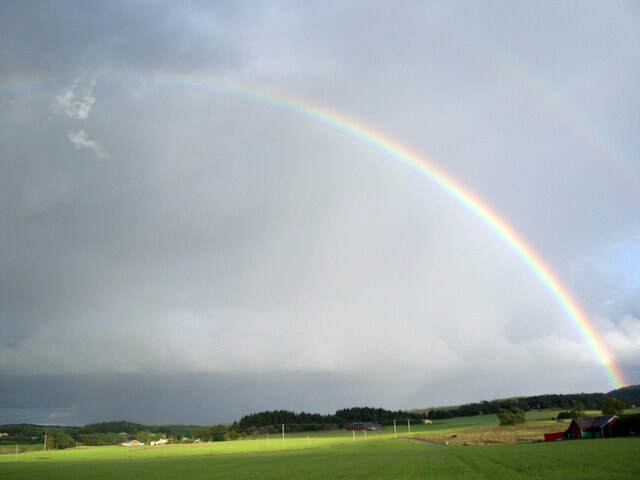 ​A rainbow requires 2 important things – a prism, light, a 42 degree angle. A prism is a 3-dimensional object with at least 2 faces that are the same shape and parallel to each other. When white light passes through a clear prism, the light bends and splits. When the white light comes out on the other side, you see all the colors of the rainbow if you are looking at it at a 42 degree angle. ​In the sky, the rain droplets are like tiny prisms and the sun is the light. If the sun is behind you and you look at the rain, the water droplets that are at a 42 degree angle to you will show you a rainbow. Since we all stand at slightly different positions, no two people see the same rainbow! ​Whenever you get to see God’s rainbow, He is renewing His promise to you that He will not flood the whole earth again. We can depend on all of God’s promises to get us through good times and bad times. What is your favorite Bible promise? This quarter, as a class we will memorize what God made on each day of creation week. Children who complete their memory mastery project will earn a Bible artifact to add to their collection. On day 1, God made light. On day 2, God made the sky, and water covered the earth. On day 3, God made land, plants, and trees. On day 4, God made the sun, moon, and stars. On day 5, God made birds and fish. 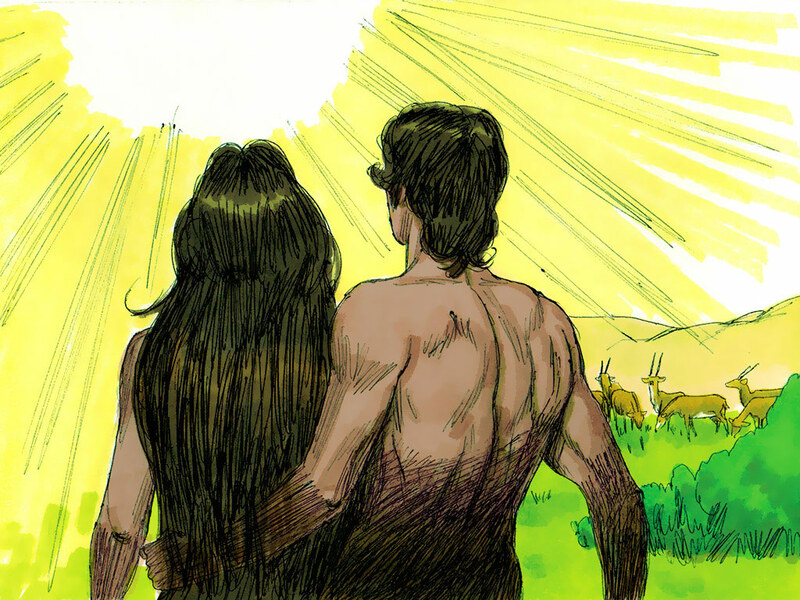 On day 6, God made animals and two people, Adam and Eve. On day 7, God rested from all His work. He called the 7th day – the Sabbath. Please help your child fill in the blanks on these facts about the Sabbath. ​Sunday, Monday, Tuesday, Wednesday, Thursday, Friday, Saturday. This quarter we are helping our brothers and sisters in Asia share Jesus with the people there. One special project is we are building a church in South Korea. Please bring your coins to Sabbath School to dedicate to the world mission project. ​God had given Adam and Eve a home called the Garden of Eden. As He walked them around to see everything, they stopped in front of 2 trees. “This is the tree of life,” God explained. “Eating this fruit will keep you living forever.” Then, God pointed to the other tree and said, “That is the tree of knowledge of good and evil. Do not eat its fruit. If you do eat of it, you will die.” Adam and Eve agreed to stay away from it. 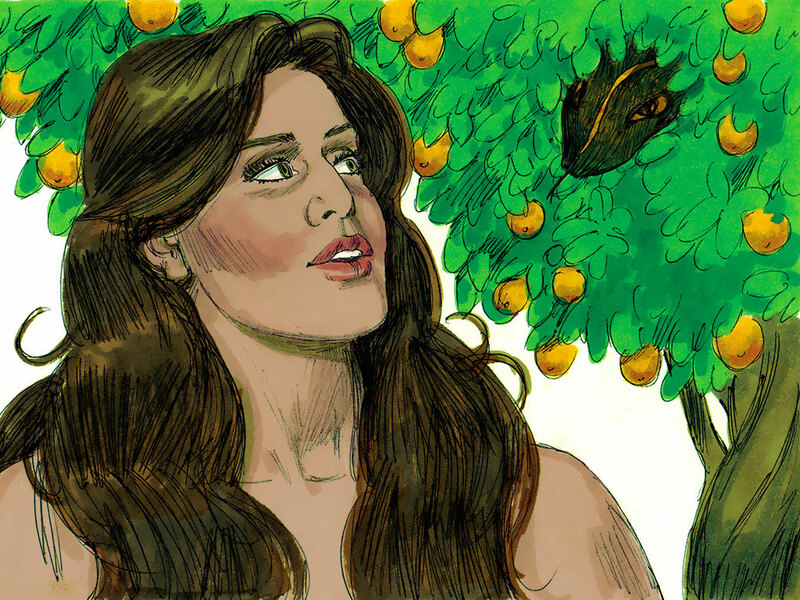 Eve decided to disobey God and taste the fruit. Then she gave some to Adam. Soon afterward, they felt chilly. The light that surrounded each of them was gone, and they were naked. After they covered themselves with fig leaves, they hid from God. When God found them, He covered them with lamb skins and blocked them out of the garden away from the Tree of Life. From then on, sin and death entered our world. ​Our Bible story reminds me of the prayer verse, James 4:7, which says, “...Submit to God. Resist the devil and he will flee from you." (NKJV). That evil serpent in the garden of Eden was the devil in disguise (Revelation 12:9)! He was the first angel that sinned in heaven. Now he is on earth trying to convince people to sin and disobey God. But, Jesus, the Lamb, died to save us from sin and eternal death. With His help, we can choose to submit to God. That means, we can depend on God’s power to obey. We can also choose to resist the devil. That means, we can say, No, to sin. God warning Adam and Eve about the tree of knowledge of good and evil reminds me of a helpful saying when you are outside: “Leaves of 3, let them be.” Many plants are ok to touch. Some plants are ok to eat. But, some plants are poisonous. They can hurt or kill! One plant that is especially poisonous to touch is called Poison Ivy. It is a vine plant that has leaves growing in groups of 3. The edges are mostly smooth with an irregular jag in them. Poison Ivy can cause a terrible rash on your skin if you touch it. The rash itches, burns, and oozes. When you scratch your rash, you can spread it on your body. If you think you came in contact with poison ivy, the best thing to do is wash the affected body part in cold water right away. You may be able to rinse the oils off before they get into your skin. Be careful not to touch your face, eyes, or private area. Go on a nature walk to look closely at leaves. 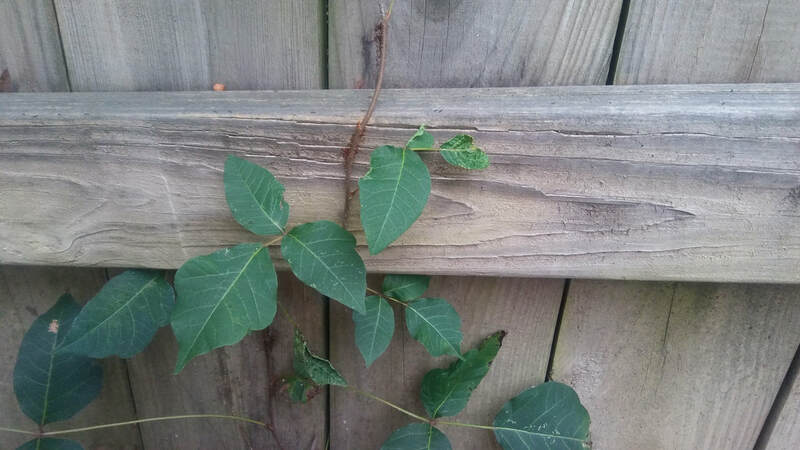 If you see any vine plants, stay back and look from afar to make sure it is not poison ivy. For more pictures of Poison Ivy in different seasons, visit www.poison-ivy.org . The Northern-Asia Pacific Division presents some very challenging territory for spreading the gospel. In all of the countries there, Christianity is not a popular religion at all. In some places, Christians are under persecution and must worship in secret. Bring your coins each week to Sabbath school to support the work of God in Asia. We are building the first Seventh-day Adventist Church in Sejong, South Korea. ​When it was time for God to create the earth, the universe already hummed and glittered with stars, galaxies, worlds, and angels. God needed a special place for human beings and the creatures they would take care of for Him. God the Father, Jesus the Word, and the Holy Spirit found the perfect dark spot in the universe for this new world and its solar system! On day 1, God announced, “Let there be light.” And a bright beam of light illuminated this dark corner. The light was day, the darkness was night. On day 2, God commanded the waters to gather together, so the sky could exist. On day 3, God called the land to come up out of the waters. He told the plants, flowers, and trees to appear. And they did. On day 4, God commanded the sun, moon, and stars to shine. Bling, bling, bling! They appeared. They help us track time. On day 7, God rested from His work. He blessed the day forever, so we could always remember this special week of creation. He called the 7th day – the Sabbath. ​Our Bible story reminds me of the prayer verse, Exodus 20:11, which says, “For in six days the Lord made the heavens and the earth, the sea, and all that is in them, and rested the seventh day. Therefore the Lord blessed the Sabbath day and hallowed it. " (NKJV). Do you like to celebrate your birthday? God set aside our weekly Sabbath to celebrate the birth week of this earth. Take time each Sabbath to marvel at God’s creation. Observe a bug, touch a leaf, listen to the birds. God made all these things for us because He loves us. ​Every living thing has a place it likes to call home. Scientists use the word, habitat, to describe the special place where living things have all that they need to survive, including food, water, shelter, and a place to raise their babies. When God’s creatures don’t have all the things they need to survive, they must look for another place to live. Others just die. When God made our world, He was thinking about all of our needs. 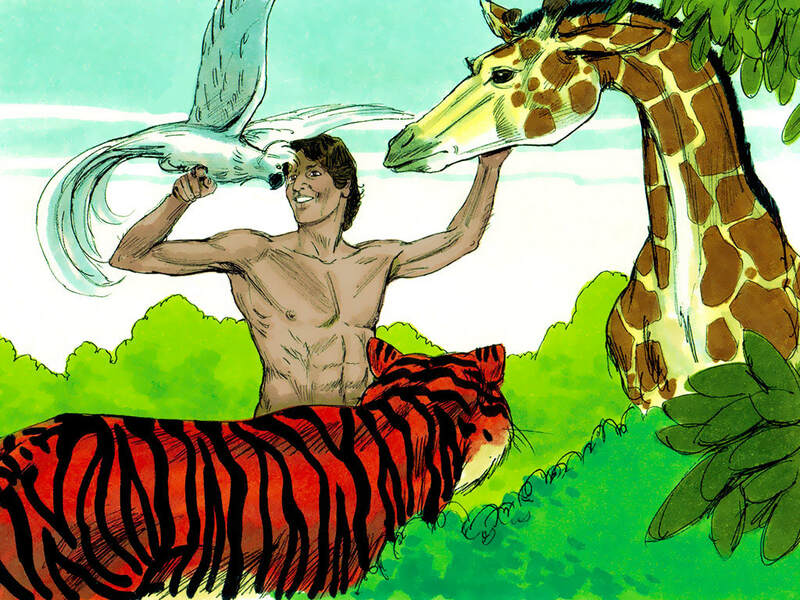 He gave Adam and Eve a special habitat called the garden of Eden. 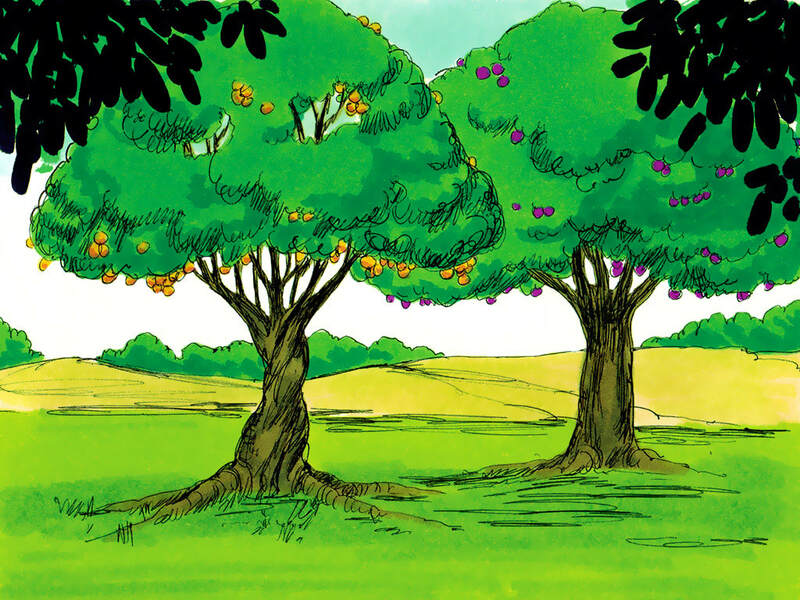 There He surrounded them with plants and trees that provided them with fruits and seeds to eat. There was a clean river with water to drink. The trees provided shelter, and they used the vining plants to make a special home to start a family. Go on a nature walk to discover the elements of a habitat for birds or bugs. 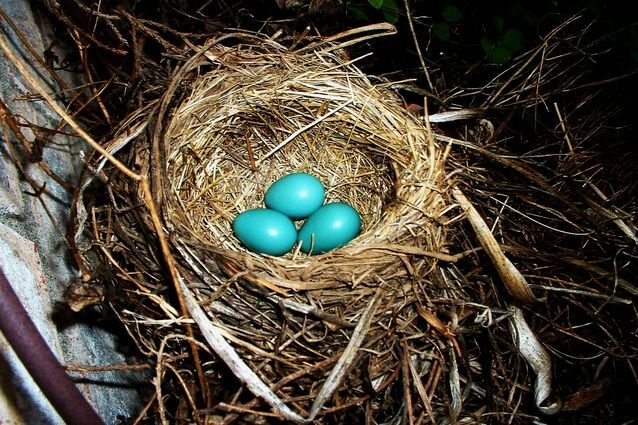 See if you can find a source of water, food, shelter, and nests. Consider making your own backyard a good habitat for wildlife and butterflies. Visit the National Wildlife Federation for how to do it. This quarter we are helping our brothers and sisters in the Northern-Asia Pacific Division share Jesus with the people there. The countries of focus include China, Japan, Mongolia, North Korea, South Korea, and Taiwan. The world church is building the first Adventist church in Sejong, South Korea among other projects. Will you bring your coins all quarter long to give to the world mission project?